While the selection of Mac Real Estate Software products is limited, the quality of the options available is excellent. The leading Mac CRM Software product is called RealtyJuggler Real Estate Software and is published by RealOrganized, Inc. RealtyJuggler has a loyal customer base and the developer has been around since 2004. The product is upgraded regularly and the technical support is excellent. RealtyJuggler has all the key features a REALTOR (or other real estate professional) needs to track prospects and deals including sending letters, Drip Email and printed letters, action plans, tracking of expenses, commissions and lockboxes. Features include additional capabilities in the areas of tracking of deals (also known as Transaction Management) as well as rental management. RealtyJuggler runs as a web site. There is no software to install. RealtyJuggler has been optimized to run on any standards based web browser such as Apple's Safari as well as Google Chrome and Firefox web browsers. You can even use it on Internet Explorer. Since the software runs as a service, it is purchased as a yearly membership. Upgrades are included with the Membership and are automatically applied when you sign in. The database is multi-user allowing easy sharing of information with partners or assistants. Since the data resides on an internet "cloud", the database is automatically redundantly backed up for you. If your computer should crash or get stolen, your data will not be lost. 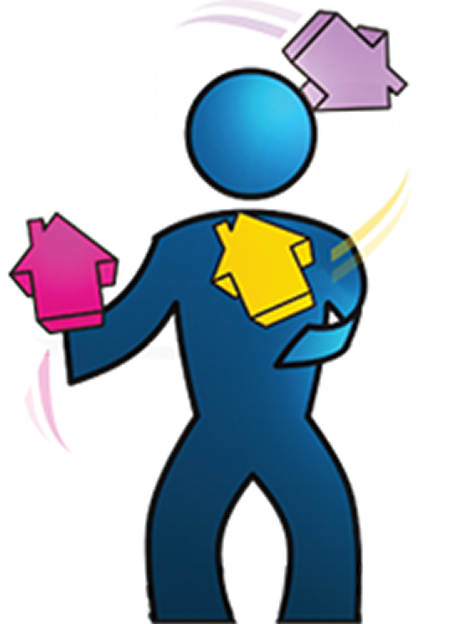 RealtyJuggler also offers synchronization of Contacts and Appointments with Gmail. Macintosh users can be rather picky about the user interface of the software they use. With RealtyJuggler, the user interface is extremely simple to master and is geared towards a busy agent who doesn't have time for complicated features. Additionally, RealtyJuggler runs on the iPAD as well as the iPhone. RealtyJuggler is available on a free-trial basis so the best way to evaluate the product is to check it out yourself. Are you wondering if RealtyJuggler has enough features for you? RealtyJuggler includes a comprehensive letter library, over one hundred flyers, and can synchronize with both Google as well as Microsoft Outlook.